We invite you to join us on February 7 at The Leonardo museum in Salt Lake City to take in the Dead Sea Scrolls Exhibit: Life and Faith in Ancient Times. Salt Lake is one of only ten cities in the U.S. to host the Scrolls before they return to Israel. For general information about this exhibition, see http://www.theleonardo.org/exhibits/discover/dead-sea-scrolls-life-and-faith-ancient-times/. We have arranged for a 1pm introductory lecture, followed by Q&A, with Risa Kohn, a prominent Scrolls scholar who is a main curator of the exhibit. At 2pm we will enter the exhibit itself, which generally requires about two hours to survey adequately. We have also arranged special pricing for our group: $15 per person (rather than the standard $24 price). In order to secure this price and a seat at the lecture, however, one will need to register by January 15 via the link below. You are of course free to visit the exhibit without the lecture and on your own at the regular price on some other occasion; the exhibit will remain at the museum into April, though it is hard to anticipate the crowds toward the exhibits closing date in warm weather. This entry was posted in News on January 10, 2014 by Administration. The conference “The Lady of the Temple,” which took place on October 23, 2013, in Logan, Utah, was filmed. The videos are now available for free viewing in 1080p HD resolution, on the Academy for Temple Study’s website at this link, and on the Academy for Temple Studies YouTube channel. This entry was posted in News on November 27, 2013 by Administration. Margaret Barker’s paper from the 2013 “The Lady of the Temple” Conference has now been posted to the website. You may read it here. This entry was posted in News on October 31, 2013 by Administration. This entry was posted in News on September 29, 2013 by Administration. A detailed schedule, including abstracts of the presentations, has been posted for the upcoming “The Lady of the Temple” Conference which will take place in Logan, Utah, on October 23, 2013. Click here to see the schedule and abstracts. This entry was posted in News on September 11, 2013 by Administration. 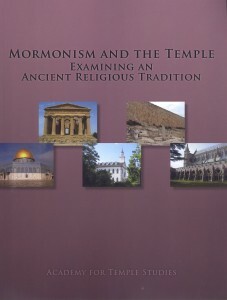 The conference that was held in Logan, Utah, on October 29, 2012, entitled “Mormonism and the Temple: Examining an Ancient Religious Tradition” has had its proceedings published in book form. This book has been available to conference attendees, and for ordering for several months. The proceedings are now also available for free in PDF format for download. Click here to download the proceedings book. This entry was posted in News on August 26, 2013 by Administration. The Academy for Temple Studies and the Utah State University Religious Studies program announce a conference we believe may be of interest to you, entitled “The Lady of the Temple: Examining the Divine Feminine in the Judeo-Christian Tradition.” It will be held on October 23, 2013, on the campus of Utah State University. We invite you to save the date. You may see more details and register on the Conference page of the Academy for Temple Studies website. This entry was posted in News on July 10, 2013 by Administration. This entry was posted in News on May 14, 2013 by Administration. A 30 April 2013 update to the Academy’s bibliography is now online. It features many new refinements to the existing entries and associated key words, as well as over 200 new titles. See “Update History” for details. A list of articles published over the years in BYU Studies which are relevant to the temple has become available: BYU Studies Articles on the Temple. This entry was posted in News on March 23, 2013 by Administration.